I made this bean dessert when inviting some friends/ ex-colleagues of mine to the house. One of them quit his job to travel a few months, but in Thailand, not Vietnam (Thailand is more open to visa issue than Vietnam). 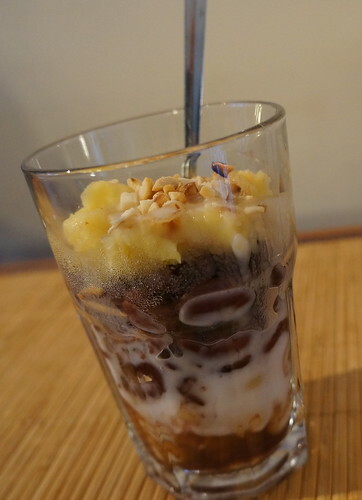 I know in Thailand, these kinds of dessert are also available, in Vietnam we call it ‘chè Thái’, we also have ‘pulut hitam’, a sweet dessert from Malaysia and Singapore, which we call it ‘chè Singapore’, or ‘bobo chacha’, which is a wrong name for a different type of Singapore ‘che’. But anyway, for anything that is sweet, served as dessert or snack, is called ‘chè’ in Vietnam, and there are dozen types of Che. (I use this link from an Italian who lived in Saigon so you know it’s also worth a try for an open westerner). The reason I made this version of che is because it comes from the central of Vietnam, which I don’t think my colleague can find in Thailand. Personally, I also like it a lot. There is a place which sells these sweet desserts in the center of Danang, very near my high school. So we often had it after leaving school (in the afternoon or some times, even before lunch). Even though this is call dessert, Vietnamese people do not normally have this after dinner. We eat this at 4-5 in the afternoon, like a sweet snack. After dinner, we normally have fresh fruits. (Probably that’s why we are not fat :D). This dessert is nice once the bean is cooked thoroughly, so it’s very soft. There should be more than one type of beans. That’s is why it’s called ‘thap cam’, which means a mix of several things. The blend of coconut milk into the beans and the bean syrup adds more flavor to the dessert. The shop which sells this kind of dessert near my high school adds crushed peanuts in it and I like to add it too. Last but not least is adding shredded coconut on top. The peanut and shredded coconut I would say optional, but always nice to have at least one of the two. And my friends like it. They say in Turkey, there is also a sweet beans which is similar to this. An Indian guy said I should put vodka into it to make it more delicious (good idea but not sure). This might be strange to you but this red bean or avocado is eaten as a meal by Mexican but we eat beans and avocado as dessert. (Avocado is nice to mash them with sugar, chill and eat. Or use a blender to make smoothies out of it with condensed milk). Even though I list the ingredients out, it’s really up to you the proportion of beans. I like red beans more so I use more of it. The broad white bean can be replaced by white bean, lima bean,… I recommend at least you have the red bean (azukia bean) since it will give a very nice taste to the syrup later. – Put different beans in different containers. Soak them in water over night. – After about 8 hours, drain them. – Use separate pans to cook the beans. Mung bean as you can see is mashed so it needs to be in a separate pan. Use 2 pandan leaves for mung bean, and 3 leaves for different beans to cook together. I used tea filter bags to put the leaves in so the beans do not stick on the leaves. – Cook mung bean till they are soft and lose all of the shape under medium to low heat, with pandan leaves. When they are almost mashed, remove pandan leaves. The mung bean should be mashed like mashed potato. Add in 100-150g sugar to sweeten it. – In two different sauce pans, cook white bean and red bean with pandan leaves under medium to low heat. The cooking time would take at least 1.30 hours till the beans are soft, but not too soft so they don’t lose their shape. Since I have a slow cooker, I put the beans together in the slow cooker with water double the bean. Put pandan leaves into the slow cookers as well. Stir in 1/2 tbsp of salt in the beginning. The slow cookers should tell you when it’s done. – If you use a slow cooker, take the bean out to a normal pan. You should leave the water about 1/2 the amount of beans. Sweeten with the rest of sugar and cooked for about half an hour more. The water will become syrup like because of the taste of the beans and sugar. Adjust the amount of sugar to your taste. – Roast peanut in a pan till the skin start to part away from the peanuts. Wait till they are not hot and use your fingers to remove the skin off (or alternatively, you can put them all into a tea towel and rub them to remove the skin). Crush the peanuts into small pieces using a blender or a food processor. (In the past, we put them all in a nylon bag and use a glass bottle, i.e., white bottle to roll all over the bag). However, I think breaking down peanuts into half is good enough for this already. – Add a layer of white bean, a layer of red bean. 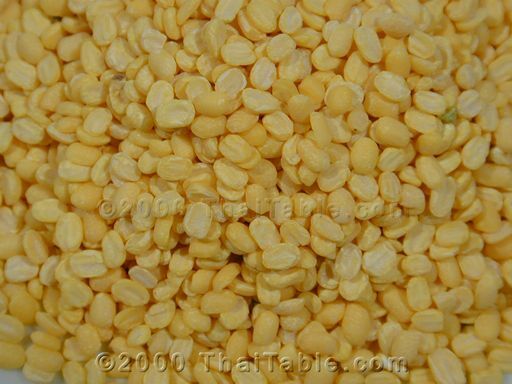 Top with a layer of mung bean (mung bean should be less than other beans). Pour with 1-2 tbsp of coconut milk. Top with peanut and shredded coconut. Serve cold. In Vietnam, I think a layer of crushed ice is laid down first before the beans. But since it’s cold in the Netherlands, keeping the bean in the fridge is cold enough for me. You can also store the beans in the freezer. I stored red beans to make azuki bean paste later to make a green tea roll. Note: try different coconut milk because it also affects how good the dessert is. I like a very smooth texture of the coconut milk and a sweetened one (but not too sweet). Ngâm đậu vào buổi tối trước khi đi ngủ hoặc 8h trước khi nấu. Đậu xanh thì nấu riêng. Đậu trắng và đậu đỏ thì có thể nấu chung với nhau. Cho 2-3 cọng lá dứa vào cho 100g đậu cho thơm. Khi nấu gần được (đậu xanh nấu nhuyễn, còn đậu đỏ, đậu trắng nấu mềm) thì lấy lá dứa ra và cho đường vào nếm vừa ăn. Đừng cho đường vào lúc đầu vì như thế đậu sẽ bị cứng. (Nấu chè bobo chacha cũng tương tự). Đối với đậu đỏ có thể cho thêm một ít muối lúc đầu để cho thấm và cho muối vào thì đậu cũng nhanh mềm hơn. This entry was posted in Desserts/ Sweets, Vietnamese and tagged chè, coconut milk, mung bean, peanut, red bean by QA-no9blue. Bookmark the permalink.